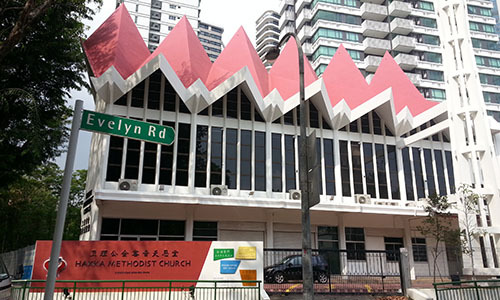 In September 1936, renowned Chinese Christian evangelist, John Sung, conducted a gospel rally in Telok Ayer Chinese Methodist Church while passing through Singapore. A youth named Lim Kim Seng was converted during the rally. He began to proclaim Christ, and started a congregation in a charcoal shop in Bukit Panjang. 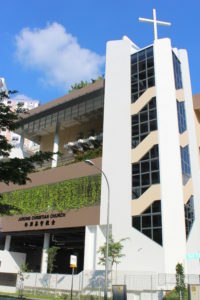 By June 1937, the charcoal shop located in what was then a farming and fishing community was renamed as ‘Bukit Panjang Methodist Gospel Hall’ – the predecessor of the current Bukit Panjang Methodist Church (BPMC). More than 80 years later, we have seven worship services and one children’s worship session, with nearly a thousand worshippers. We gather regularly in The Sanctuary and WOW Hall in John Wesley Centre, as well as The Chapel and Multi-Purpose Hall in Trinity Theological College, as the main building is undergoing an expansion project expected to be completed by June 2018. We have a strong emphasis in making disciples and we have conducted DISCIPLE classes for more than 10 years. More than 130 church members have completed the DISCIPLE 1 course. BPMC reaches out through our seven congregations to create multiple entry points for new believers. Our mission targets are Thailand and East Asia, as well as sharing the Gospel with foreign students in Singapore. 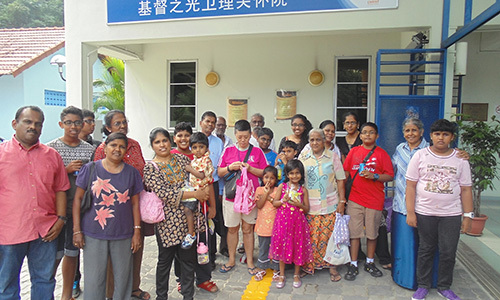 Recently, we have had increasing numbers of people from China and India joining our church. We praise God for providing us a great opportunity for spiritual harvest when Hillview MRT Station (located just in front of our church) began operation on 27 Dec 2015. 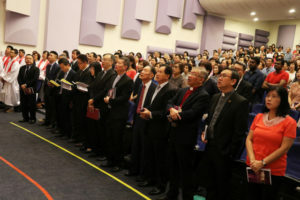 Being a melting pot of varied cultures, BPMC has to manage the different cultural mindsets of our members both in the English-speaking and Mandarin or Hokkien congregations, in order to move together for the work of God’s Kingdom. Just like in other Methodist churches, our young worshippers are also fascinated by that which is new in other churches. Besides our contemporary worship services for young people (WOW English and Lishi Mandarin) and small discipleship group ministries specially catering to this age group, we will do what it takes to encourage them to journey with us in BPMC. With our increasing numbers of seniors, our challenge is to encourage them to give their best to God; and that their contributions to God’s Kingdom, no matter how big or small, do not end with their retirement, as most of them are still physically healthy and spiritually experienced to play a part in the Great Commission. This year in June, BPMC celebrated its 80th Anniversary. The theme was “Abundant Grace”. Besides producing an 80th Anniversary Commemorative Magazine, our new church logo (top left) was formally launched during our 80th Anniversary Dinner. For the first time in BPMC’s history, we have our very own logo, designed by a church member who grew up in our church and whose late paternal grandparents were pioneers of our church. As the Pastor-in-Charge of BPMC for nearly four years, I see great potential in BPMC, a church preparing to move forward and accomplish the mission that God has entrusted to us. Back in our early days, most of our members were illiterate farmers with simple faith, reaching out to others in earnest Christian service, prayerfully dependent on God while enjoying close-knit relationships with one another. We pray that as we grow in size, we will still keep our ‘kampong spirit’ intact; the simple faith in reaching out to the unsaved with the Gospel, trusting God in prayer, and having brotherly love for one another as we grow to be true disciples of Christ. 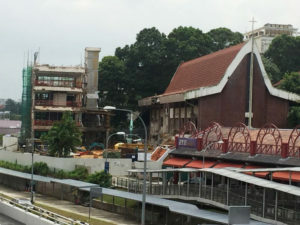 is Pastor-in-Charge of Bukit Panjang Methodist Church.